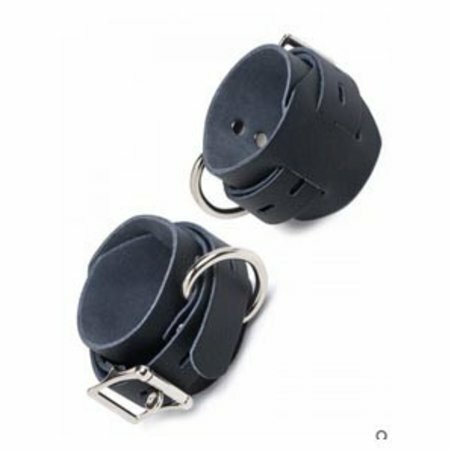 Strap these locking cuffs on your favorite sub to keep them wandering away without permission, or to get them in just the right position for an evening's pleasure. Designed especially for the discriminating vegan, they're as firm and flexible as real leather, but without any of the ethical or practical problems that come with animal products. The wrist cuffs are 2" wide and will fit wrists measuring 5.5" to 8" around.The ankle cuffs are 2.5" wide and fit ankles from 6" to 12.5". 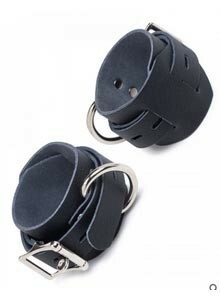 With nickel-plated locking buckles and nickel-plated D-rings, you can securely attach your partner to the nearest attachment point. The Vondage line is made from a vegan microfiber that has all the sensual feeling of leather, but is completely free of animal products. Give free rein to your most devious bedroom impulses while being kind to animals.